2-CD set of the complete opera, with bonus tracks. Chris Ware revealing astounding new discoveries about Scott Joplin and his creation of Treemonisha. Produced and engineered by Judith Sherman. Phumzile Sojola (Cephus), and Frederick Jackson (Luddud). Aunt Dinah Has Blowed de Horn. I Want to See My Child. When Villains Ramble Far and Near. We Will Trust You as Our Leader. Bowing Music on Themes from the Opera. Scott Joplin’s Treemonisha Preface read by his closest living relative, Grandniece Mrs. LaErma White of Texarkana, Arkansas. alternate with choruses that could make you weep with joy. 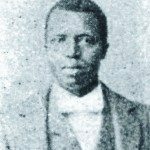 Scott Joplin’s Treemonisha is the only opera in existence about the Reconstruction era African-American experience written by a black man who actually lived through it. This fact alone makes it a work of tremendous significance. Further, Joplin’s score is profoundly expressive and as stylistically unique as anything ever created in America. Through it, the composer vividly documents the echoes of the “field hollers,” spirituals, fiddle tunes, revival hymns, and ancient African dances of his rural childhood, together with the vanished dialects of his people in their rising up from slavery. 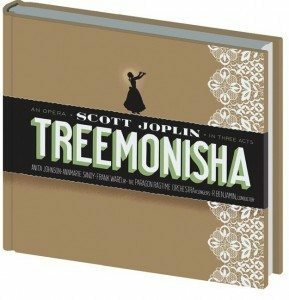 Treemonisha is Scott Joplin’s statement of deep racial pride and an act of true artistic heroism – his creation of beauty in the face of almost unbearable ignorance, racism, poverty, and physical and emotional pain. 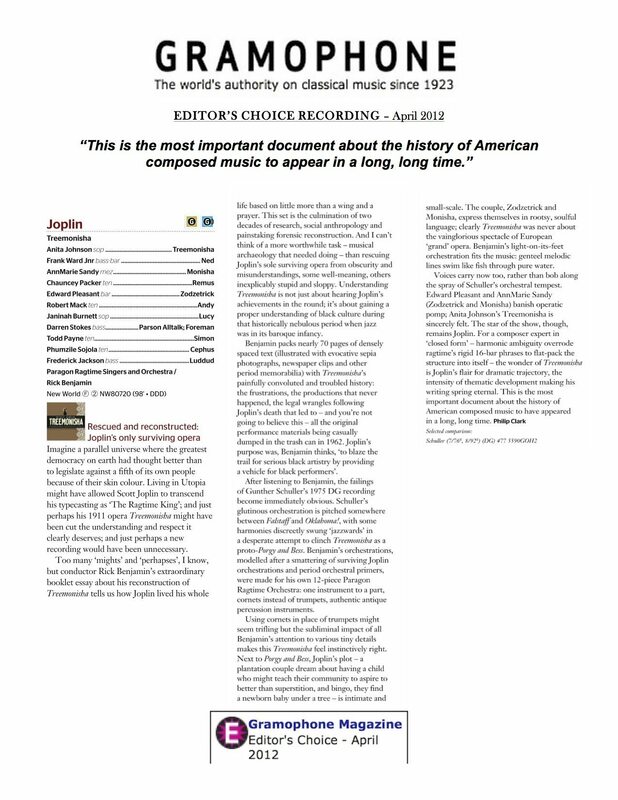 Joplin’s original 1911 performance materials for the opera were almost entirely destroyed in the early 1960s. But here now after 18 years of research is an authentic, historically correct reconstruction of this “Sleeping Beauty of American Music,” performed on this world premiere recording. Listen as Scott Joplin – “The King of Ragtime Writers” – sings the song he wanted America to hear. e-mail [email protected] for information.